Looking for a source for parts for R. Hoe & Co. No 5395. Specifically the impression mechanism. I’m in Fresno, CA. You will have to have them manufactured, which means you will have to locate a press that is the size and age of yours, and contract with a machinist to make the parts out of steel. Bob Oldham, Ad Lib Press has a list of presses around the world, but I’m not sure if it is detailed enough to know all the sizes. you will need to measure the platen and the bed, and post those along with the serial number (which can be read in the picture) and hope that someone can share the dimensions of the parts from their press. 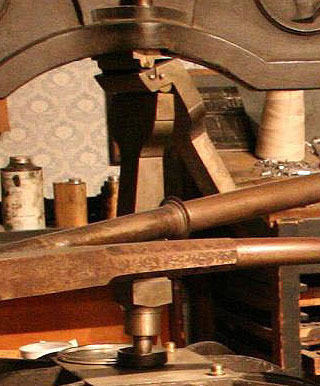 I tried to match it up with one of the approximately 150 Hoe Washingtons in the North American Hand Press Database and there are several places that have one like it that you might be able to get the dimensions of the toggle parts from. It looks like that’s all you’re missing to make it print, although I assume it also does not have the tympan and frisket. Contact me through Briar Press and I will send you the names of some likely sites in California to try. If you can get them to trace around the sides of the toggle parts you can then make measured drawings that a machinist could use to make you the toggle. The image shows what you need. I was wondering if you were able to get the parts needed for your Washington Hand press. 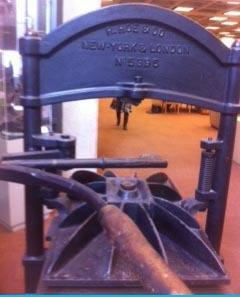 I print on a similar press here in Arizona (#5237).